Second Life, November 26, 2007: On January 15, 2008, the Ewing Fashion Agency (EFA) will be hosting the Ewing Design Awards, the culmination of the Ewing Design Awards competition sponsored by EFA and OnRez. Winners of the Ewing Design Awards will be receiving a trophy sculpture rewarding their success. Are you the artist who can create such an award? If so, we would like to encourage you to enter the EFA competition to create the sculpture for the EFA Design Award. “As a fashion promotions agency, EFA is incredibly happy to partner with OnRez for the Ewing Design Awards, a celebration of fashion design in Second Life. Artists in Second Life enliven and enrich our Second Life experience, and the EFA sculpture award merely allows us to celebrate non-fashion related artists as well,” said Connie Molinaro, Promotions and Event Coordinator of Ewing Fashion Agency. In order to enter the contest, artists must submit a original, unique piece which has not been previously sold and is free from legal and perpetual obligation. If selected as the award, the sculpture should be exclusive to EFA, and should not be resold or gifted to anyone else. EFA requests that structures have a base for labeling, and requests that the artist agree to provide a full permission sculpture to EFA (copy, modify, transfer) to allow EFA to appropriately label the same for the winners. The deadline for entering the competition is December 8, 2007 at 12PM SLT. All entered sculptures will be placed at the Ewing Garden at Ischia until at least December 15, 2007. The non-winning entries will be sent to the artists after that date. The winner of the EFA sculpture contest will be chosen by EFA staff and will be announced on on December 11, 2007 at the EFA December Winter Party! Just wanted to mention since it’s been so long and real life has interfered in the worst of ways. The People’s Choice Award is STILL OPEN. I have decided to extend it until December 1st. Remember that votes from the same IP address are only counted once. 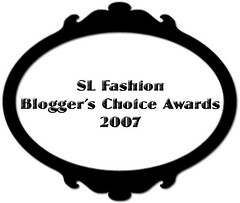 As for the 2007 SL Fashion Blogger’s Choice Awards, I will be announcing the results on Friday, December 7th. I am currently in the planning stages of a celebration party. If you would like to contribute to the party gift bag, please contact Tanya Book. I can be reached via email, SL or twitter. I found a box of hair from Philotic Energy in my inventory. I must say chocolate is my favorite of the color textures. There were more photos when I was shooting, but they aren’t on my hard drive so I guess SL is being grumpy again. The Innocent dress comes with a lot of extras that newbies will appreciate. 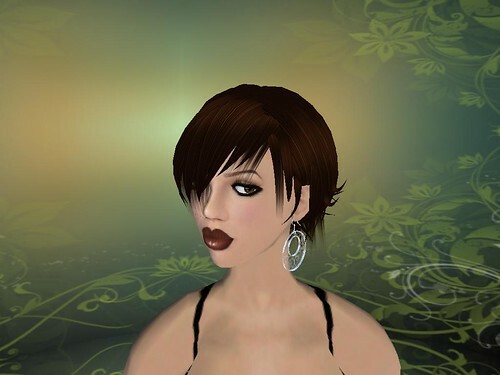 A full avatar in fact, a shape, eyes, skin (color-change brows), hair (color-change), eyelashes, lighting system, and ao. 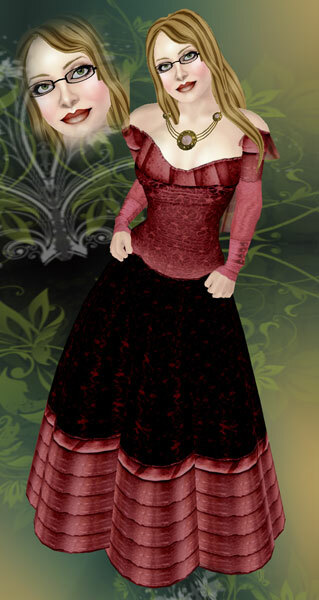 I decided to stick with the dress, hair and skin, otherwise I might as well have shown you the ad photo. The dress, as ever is gorgeous. These skins are from the fully hand-drawn line with their softer look. Naturally, the first thing I did was change the hair to blond and I had much better results matching the brows than with Pixel Dolls other line, Stella di Roccia. The eyelashes, btw, are from Sin Skins. So if you are a collector, you might already have them. I expect the ao is similar to the one used in Pixel Dolls Avatar store which also sells complete avatars but without the designer clothes. While organizing my inventory folder I ran across the following items from Deka Fashions which I thought were very cute. You are currently viewing the archives for November, 2007 at SL Fashion Notes.